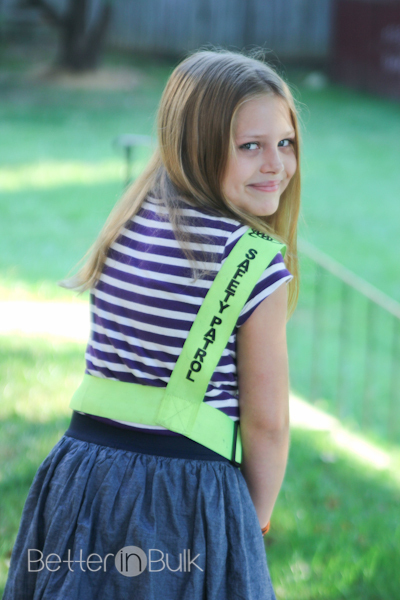 I’d like to introduce you to my newest writer at Better in Bulk – my 10 year old daughter, Reese, who just happens to know a LOT about being a good safety patrol. Reese has been eager to start blogging like me (she is an awesome writer of fiction, and I might just convince her to share some of her short stories here in the future) and today we took the plunge, showed her the ropes around here, gave her a few topics to chose from and started #ReeseWrites. As a 5th grade patrol with duties before and after school, Reese’s main responsibility is to make sure that the younger kids who are walking to school and back home each day get where they need to go safely. She was one of the first patrols in her grade to pass off the patrol certification, and she is passionate about being a good patrol! Being a patrol can be tough sometimes because you have to get up early every day and leave on time to get to post before the other kids start walking to school. Being a patrol can also be so much fun because you get to see some of your friends and spend 20-25 minutes with them in the morning and afternoon. You also get to miss a little bit of class! I personally think that being a patrol is both tough and easy, but I really just like to laugh and have a good time. Being a patrol makes me happy, and I hope I can make other people be happy and safe. I like being a patrol and hope that the time won’t pass by too quickly because it’s really fun. Were you ever a safety patrol? Have any topic ideas for #ReeseWrites? Leave your questions or suggestions and Mom will pass them on! PS: Just like my mom, Lolli, “Reese” is my nickname on the blog, just to be safe. I love the internet but Mom always reminds me to be safe and not give out too much information! Reese Franklin has written 1 post in this blog. 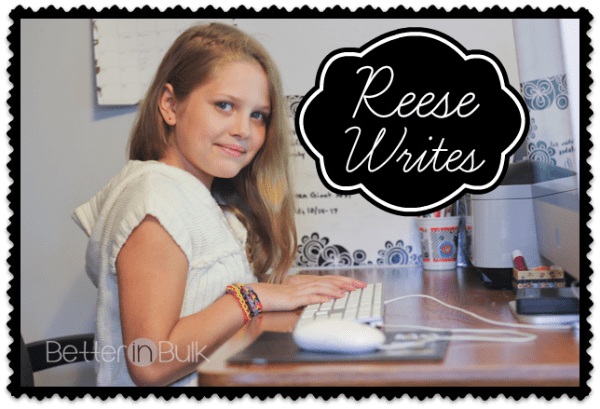 Reese is Lolli's 10 year old daughter who loves to write. Some of her favorite things include reading, baking, bracelet-making, and playing the piano and violin. She secretly wants to be just like her mom when she grows up. Love the post! I’m leaving a comment just like I promised when you were following me around all weekend! I hope you keep writing and sharing your work. You definitely have talent. Maybe I’ll see you around! Love your post! You are a great patrol. I cannot wait to see what you accomplish as an officer! I just had a great idea. We’ll talk Monday about a special assignment I think you’ll be interested in. I love your tips! I know the teacher who is your patrol sponsor would love those tips too!! Both my children were patrols and they loved it! Thanks for sharing!! I loved safety patrol. Bring on the orange sash! Both my sons (10 and 8) just started their own blogs (shameless plug and cute photo here: http://www.dirtandnoise.com/2013/10/my-boys-blog.html) so yeah for Reese! I love that kids are using their voices and sharing their insights. ahhh . . . safety patrol. . .I couldn’t WAIT to get my sash . . .my kids don’t have Safety Patrol (i wish they did), but you made some great points for everyone to remember – thanks for sharing! Love your safety patrol tips! Way to go! What a great first post! I think I did safety patrol way back then too. Great tips Reese! We didn’t have this back when I was your age but can see where it is important. Alas, I was never a safety patrol – that job was reserved for adults in my school; but I did get to be line leader often! That was a big responsibility in my school. The enumerated list of characteristics for a good safety patrol is priceless. Great post. Reese – This is a great first post! I was on the safety patrol when I was in the 5th grade – I loved it! I think your tip of ‘wear your badge and belt proudly’ is so important – you are a role model to other kids at school. I’m excited to read more of your posts! I think we called the position something different (I forget what?) but I had a similar role in 3rd grade – it was so fun because we got to leave class a bit early and it’s a great way to keep things organized and everyone safe.